Born in Jamaica, Julian Junior Marvin moved to London as a child, where his love of both acting and music was well nurtured by his family and the UK theater community. He appeared in The Beatles’ film “Help” which was followed by a number of other successful appearances on British Television. Junior was also a member of the London cast of the musical “Hair” and can be heard on the Original London Cast Recording. After playing in various London-based bands, including Blue Ace Unit, Herbie Goins & The Night-Timers, White Rabbit and Salt & Pepper, Junior continued his musical apprenticeship in America, playing with the likes of Blues and R&B legends T-Bone Walker, Billy Preston and Ike & Tina Turner. He quickly earned a reputation as an innovative and expressive blues/rock guitarist. Junior was later invited to join the Keef Hartley Band, who were pioneers of the burgeoning British blues/rock scene. 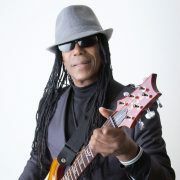 Junior made a significant contribution as a writer, singer and lead guitarist to their acclaimed “Seventy Second Brave” album and also appeared on the follow-up release, “Lancashire Hustler.” Junior then formed his own rock band, Hanson, which was quickly signed to Emerson, Lake & Palmer’s Manticore label by Mario ‘The Big M’ Medious (the label manager). Their debut album “Now Hear This,” featured Junior Marvin (Lead Guitar & Lead Vocals), Jean Roussell (Keyboards), Conrad Isidore (Drums) and Clive Chaman (Bass). This was followed by the album “Magic Dragon” on which Junior was joined by Glen LeFleur (Drums), Neil Murray (Bass) and Brother James (Percussion). Junior had also become a much-in-demand session guitarist, particularly for recording artists on the Island label, contributing to albums by Reebop Kwaku Baah, Toots & The Maytals, Stomu Yamashta, Sandy Denny, Remi Kabaka, Eddie Quansah, Rico Rodriguez and Steve Winwood. On February 14, 1977, Junior was invited to join both Stevie Wonder’s band and Bob Marley & The Wailers. His parents and musician friends helped him to take Bob Marley’s invitation because of the fact that they were both Jamaicans… and the rest is history. “Exodus” was Junior’s first album with Bob Marley & The Wailers and it was later voted Best Album Of The 20th Century by Time Magazine. He was featured on all of the subsequent Bob Marley and The Wailers albums, touring the world with them until Bob’s passing in 1981. Since then, Junior has put out four CDs with The Wailers: “ID,” “Majestic Warriors,” “Jah Message” and “My Friends” (Live) as well as numerous solo projects, including “Wailin’ For Love”, “Smokin’ To The Big M Music” and “Lion To Zion Dub Wise”. Junior can also be found on albums by Burning Spear, The Meditations, Joe Yamanaka, Joe Higgs, Alpha Blondy, Bunny Wailer, Israel Vibration, Culture, Beres Hammond, The Congos, SOJA, O.A.R. and Alborosie, amongst others. After touring with many of the incarnations of The Wailers since Bob Marley’s passing, Junior has now stepped out to front his own version of The Wailers, playing and singing all of the Bob Marley & The Wailers hits the way Bob intended them to be heard. In addition, Junior has a new album dropping worldwide in 2019 entitled “The Message Of Love”, the title track of which will also be released as a single.